CarbonFlow, a startup that makes software for carbon markets, has apparently raised its first round of funding, a source close to the company tells us. We’re not sure how much it’s raised, but Clean Pacific Ventures led the round, and OVP Venture Partners participated. 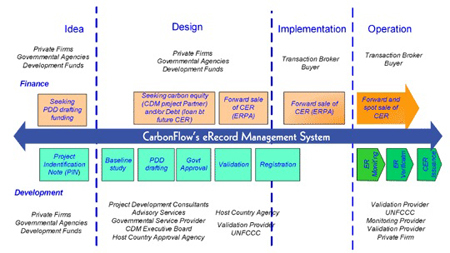 Both Clean Pacific and OVP name CarbonFlow as a portfolio company on their web sites. CarbonFlow is a two-year-old company based in San Francisco that was founded by Neal Dikeman — well-known cleantech writer and Jane Capital partner — and Karla Bell, who has been “greening” the Olympics for years and pens the blog GHGblog. Jane Capital provided seed financing for the startup. The company’s software is meant to bring transparency and efficiency in a low-cost way to the carbon markets, which desperately need this kind of help. The software enables carbon market participants to collaborate on projects, keeps a record of the work completed, and helps with validating carbon-reducing projects. The company says the software is designed to meet Kyoto standards including registration, verification, certification and monitoring. For the organizations trying to validate carbon reduction projects, CarbonFlow’s software could be a low-cost, easy and automated alternative. The startup has also partnered with a well-known leader in this area: Norwegian firm DNV, which was one of the first companies to be accredited by the UN to verify greenhouse gas reductions from projects in the developing world. The companyâ€™s software is meant to bring transparency and efficiency in a low-cost way to the carbon markets. carbon market is introducing mobile & assessiores.